2,500 ton robots kicking the crud out of skyscraper-sized monsters. 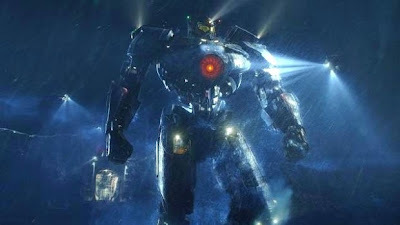 For a kid who grew up watching Godzilla clash with Mothra, Rodan, Ghidorah and King Kong a couple of times, Pacific Rim's premise is straight-up cinematic nirvana — the proverbial dream come true for this fortysomething's inner 14-year-old. And deliver upon that prodigious premise Guillermo del Toro does, the Voltron vs. Godzilla remix is the biggest, baddest B-movie imaginable — one rad popcorn flick. Launching with a compendium of the origins of our battle for planetary survival, del Toro unleashes his Kaiju, the giant reptilian beasts arising from an interdimensional portal along yes, the Pacific Rim, tearing up San Fran, Manila and other coastal burgs. Mankind turns to Jaegers, dual-piloted, 25-story machines tasked with taking down the shark-mugged monstrosities via a fist to the face or an Iron Man repulsor shot from a massive metallic palm. While initially winning the war, the attacks intensify, the Kaiju growing exponentially more rapacious with each appearance through the cosmic gateway. Tag team brother tandem, Raleigh and Yancy Becket (Charlie Hunnam of Sons of Anarchy fame and Diego Klattenhoff from Homeland) pay the price, their Jaeger getting shredded, leaving Raleigh to go solo as mankind's forced to retreat and regroup. That's right about when Pacific Rim stalls out, del Toro – with co-writer Travis Beacham – relying on one-dimensional characters to carry the film through its re-strategizing portion. Holed up in something called the Shatterdome, Raleigh bonds with his new "drift-compatible" partner Mako (Rinko Kikuchi from Babel) as their commander, Stacker (Idris Elba), drops nuggets such as: "Vengeance is like an open wound". But once we reach the rousing "WE ARE CANCELLING THE APOCALYPSE!" conclusion, all is forgiven as del Toro dispenses some of the sickest FX sequences ever splashed across a screen. None more eye-popping than a wing-sprouting Kaiju snatching a Jaeger, soaring to the stratosphere, only to get sliced in two by a supersized sword. It's empyrean escapist entertainment of off-the-charts ambition and scope that demands to be seen on the most immense screen possible — this is why IMAX was invented.